Share what you thought about Bound in Blood and earn reward points. 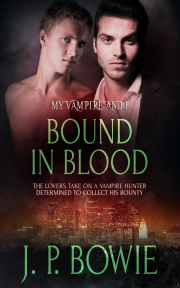 Bound in Blood is a fantastic novel that has everything a paranormal junkie could ask for...I would recommend this book to anyone who wants to see beautiful men and great chemistry. With loads of intense passion, meddling friends, and the threat by an ongoing enemy Bound by Blood" is sure to keep the readers attention to the end, it has also become my favorite J.P. Bowie book.